A blackhead in the ear can sometimes be impossible to deal with. It is often times the inability to see them that can be most frustrating when trying to treat them. There are a variety of options available for treatment in the ears, just as there is for the rest of the skin on our body. But it can be a delicate area to treat, and at times you might need help. One method for extraction may only work for you depending on the location. Normally, I wouldn’t recommend the use of a comedone extractor for home use, but the ear can be an odd place to try to remove blackheads using the normal methods. It’s not exactly the best location to try a clay mask. 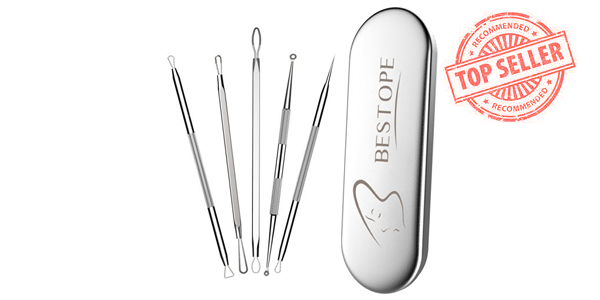 A comedone extractor is a tool that dermatologists use. You can sometimes acquire them directly from your doctor to use at home. You can also purchase them at Amazon. The problem you might have using these in your ear is the location of the blackhead itself. If you’re unable to see the blackhead, you’re going to need help using this tool. This is a treatment that gently sands the skin to remove the top layers. For blackhead removal, it’s useful getting to the stubborn plugs. A dermatologist has dermabrasion tools they use to gently abrade the skin that can be used for this area that’s useful for blackhead removal. Exfoliation would be the preferred method to use if you’re going to treat your blackheads at home. You just need to gently exfoliate the area. Anything with salicylic acid would be considered an exfoliant. Baking soda is gentle enough for the area if you don’t over use it. If you mix a teaspoon of baking soda with a ½ teaspoon water to make a thick paste, you should have something that can gently exfoliate the area. You can gently apply it to the area with your fingers, massaging it in. If you have someone to help you, you can use cotton buds (or q-tips) in hard to reach areas. Remember not to ever go near the ear canal. Let it dry completely, and then rinse the ear with warm water. You would do this once a day for 3 days until the area is clear. If it’s not clear after that, do not continue using it as baking soda tends to mess with the pH levels in the skin. Normally baking soda is a treatment you would only use once a week at most, so be careful with this one. If your skin gets irritated at all, then stop using it immediately. As an alternative, you can try using a glycolic acid on the area. Normally you would apply it with a cotton pad and leave it on for up to 10 seconds before rinsing with cool water. A natural alternative to this would be pineapple juice. You could apply the treatment every night. There are conditions with this one. You have to monitor the skin really closely. If you’re going to actually use glycolic acid, be aware skin can sometimes not tolerate it at all. It could get red, irritated, and start peeling. Some people tend to only use it once or twice a week. Personally, I only use the pineapple juice, and even then only when I have a blackhead I need to remove. If it’s something your skin is reacting to, just stop using it. A warm compress helps open the pores and clean the out. This is a pretty basic method for any blemish, but for the hard to reach areas it’s sometimes the best you can do. Especially if you don’t have someone around to help you with any of the other methods, or if nothing else has been working for you. Boil a cup of water. Remove it from the heat and add in a washcloth to soak up the water. Remove the washcloth from the water and gently ring out the excess water. Careful with that step, as the water may still be too hot. You then need to apply the compress to the blackhead. It may help to fold the wash cloth in half, or in thirds. Keep the compress over the area for 10 minutes to soften the blackhead. Once the time has passed, gently smooth the area with the washcloth to remove any debris that might have loosened. Since there’s no chemicals involved, you can actually do this up to three times a day. Your only restrictions is if your skin is at all sensitive to the heat. If you are prone to blackheads in the ear, you’ll need to remember to clean your ears. Many people will clear the ear wax out with cotton buds and call it done, but that’s not really enough. If you’re prone to getting blackheads in any area, you need to clear away the excess oil and dead skin that area accumulates. That includes the ears, so be sure you’re washing your ears twice a day (either do it along with your regular face washing routine, or in the shower). Washing with a gentle cleanser twice a day in and around your ears will help control the oil. When you take a shower, once or twice a week run a washcloth over the skin around and in your ears to try and remove any excess dead skin there might be. It’s perfectly fine to use a toner in those areas, such as behind the ear and just inside. Many people use plain rubbing alcohol when they have a blackhead, as it will dry it out and kill the bacteria. It wouldn’t be my preferred method, but it’s certainly an option. You could also try using something such as apple cider vinegar. It’s a pretty basic one on its own. You would mix One part vinegar to three parts water. It’s a much gentler option. Keeping your ears clean will help control future blackheads from forming. It’ll also help clear up any current blackheads you have in there.